Maintaining a large-scale irrigation system takes expertise and knowledge. As one of Long Island’s premiere commercial irrigation companies, Hi-Tech Irrigation has the experience to professionally manage even the biggest of jobs. Our team specializes in designing and installing systems for golf courses, athletic fields, apartment complexes, parks, and more. 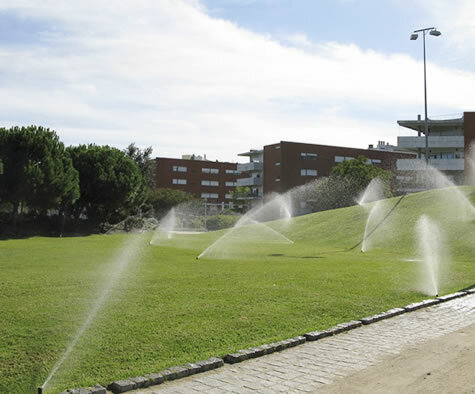 Choosing the right irrigation company for your commercial property is not an easy job. There are plenty of companies that will promise you a service that they are not equipped to provide. With over 40 years in the Long Island irrigation business, we have the experience and staff to get the job done right. At Hi-Tech Irrigation, we recognize that no two jobs are the same. Over the years, we have established and maintained working relationships with property managers, home owners associations, private builders, golf course managers and commercial building companies across Long Island. We pride ourselves on our commitment to excellence and we will work with you to formulate the best system for your individual needs. Together, we will develop a timeline and budget for your commercial job. Our in-ground irrigation systems are designed to provide adequate water for your lawn and shrubs to thrive in even the harshest of conditions. Our professional team will install a system that is efficient and minimizes any unnecessary water waste. We will formulate a watering schedule that avoids any interference with pedestrians or customers, yet effectively maintains the beauty of your property. We provide maintenance services for your commercial irrigation system that include spring start-up and winterizing, as well as any occasional adjustments that your system may need. In addition to initial installations and maintenance, we also renovate and improve existing irrigation systems. If your current commercial sprinkler system is not functioning properly, our professional repair staff can assess and correct the issue. We are fully licensed and insured and use only the top of line products for our installations and repairs. Servicing all of Long Island for one 40 Years. Call today for a free estimate and save! When Should I Water My Lawn, and For How Long? What is a Drip Irrigation System, and Do I Need One?